I really love Italian-style meatballs. But if you’re looking to cut down on the fat in most traditional meatballs, here’s a relatively low-fat alternative, using turkey in the place of beef and/or pork. 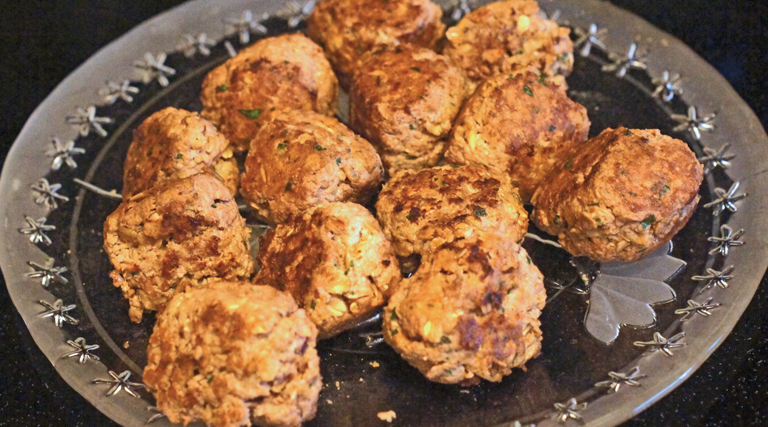 These turkey meatballs are also a little unusual in that they have oatmeal, which gives the meatballs an interesting texture and helps bind the meat in lieu of bread crumbs. Although the recipe is simple and requires few ingredients, these turkey meatballs are really flavorful. Combine all of the ingredients except the olive oil in a large mixing bowl. Mix well until the ingredients are thoroughly blended. Shape the mixture into meatballs of your favorite size. This recipe makes 14-16 medium-sized meatballs. Place the meatballs on a cooking sheet or platter lined with wax or parchment paper. Heat the oil over medium heat in a large skillet. I highly recommend using a non-stick pan since the turkey has a tendency to stick to regular pans. Cook the meatballs, turning occasionally, until lightly browned on all sides. Note: The meatballs will not be cooked through at this stage, but will finish cooking in sauce. Transfer the browned meatballs to a platter for later use. Finish cooking the meatballs in your favorite sauce for 25-30 minutes to cook through.